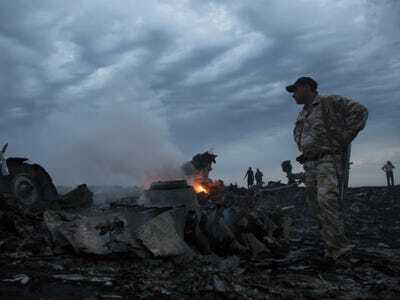 AP Photo/Dmitry LovetskyPeople walk amongst the debris, at the crash site of a passenger plane near the village of Hrabove, Ukraine, Thursday, July 17, 2014. A new video published by the Associated Press over the weekend shows billowing black smoke, fire, and confused residents in the immediate aftermath of the MH17 crash over eastern Ukraine. The witness video is likely the first that was shot after the plane went down. People who live in the village near the crash site first thought the Malaysia Airlines passenger plane was a Ukraine military aircraft. The plane came frighteningly close to the village, and the wreckage is clearly visible form where the residents are. U.S. officials say pro-Russian separatists in eastern Ukraine are to blame for shooting down the passenger plane carrying 298 people. MH17 was likely mistaken for a Ukrainian aircraft. Every passenger on the plane died in the crash. Russia has been accused of supplying the separatists with weapons, including the missile that took down the plane. On the day of the crash, Associated Press journalists reported seeing a Buk missile system in the area of eastern Ukraine where MH17 went down. It was reportedly being transported by a man wearing “unfamiliar fatigues” and speaking with a Russian accent. Russia propaganda network Russia Today released a documentary last month claiming that a Buk missile couldn’t have been what took down MH17. RT contends that cannon fire from what was presumably a Ukrainian jet is what likely shot down the passenger plane. This conclusion is shaky — Bellingcat’s Eliot Higgins pointed out that another Russian propaganda outlet earlier disproved that MH17 was shot down by a cannon.